Golfers paradise! Ready to own a piece of the resort life? Choose this Corner Lot on Hole 4 3 bedroom home with Den/office and 3-car garage inside the sought after well manicured Diamond Hill community one of Valricoâs premiere GATED communities. When you live here you enjoy many amenities including âstate-of the-artâ on-site fitness center beautifully appointed club house with kitchen olympic sized swimming pool sports court and play area. Enjoy serene living and practice your swing on the golf course which sits just beyond your back door. Sip your morning coffee from the screened lanai enjoy candle light dinner in the formal dining room work on your business inside the den hang out with guests in the open-concept living room and kitchen. This kitchen is adorned with new appliances cabinet knobs and pulls and large walk-in pantry. There is ample space here for you and your guests the home has just over 2000 sqft. NEW EXTERIOR PAINT (2018) NEW APPLIANCES (2017/2018) NEW luxury vinyl plank flooring (2017) NEW AC (2018) NEW WATER HEATER (2016) NEW Garage door wifi opener NEW 5ââ Baseboards. The master bedroom & bath are king sized furniture garden tub separate shower and dual sinks and HUGE walk-in closet. The current owner used the den as a fourth bedroom you can too! 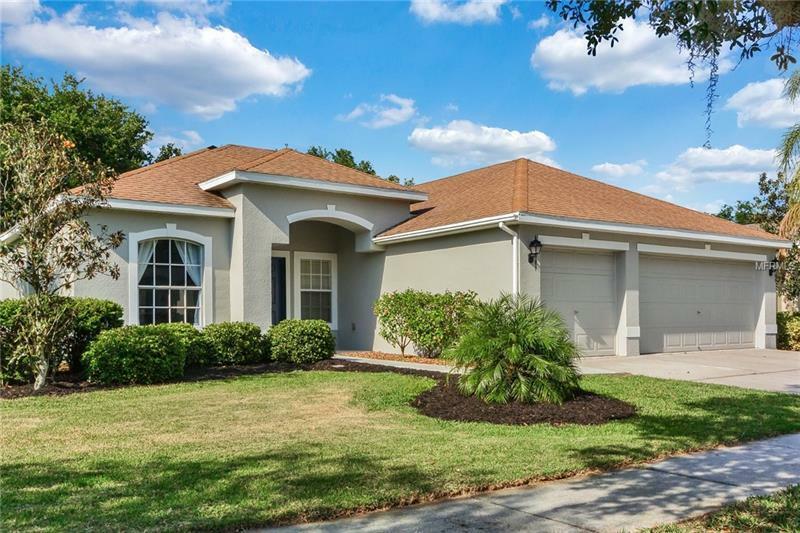 This home is conveniently located close to shopping a short commute to Tampa and perfect for the individual or family that likes a community golf course clubhouse or that resort like feel. See it right away!